It's time to get serious about sandwiches. For the next 3 weeks 20 food bloggers and myself will be eating, sleeping and breathing sandwiches. As you know I am participating in the Emeril Lagasse Serious Sandwich Cook Along sponsored by Morrow Publishers. We will share our thoughts, photos and even some recipes from Emeril's new book: Kicked Up Sandwiches. And one lucky reader (that's you) will have a shot at winning their very own copy of this unique book. Now let's talk football. I'm not a football fan at all but I love it for two reasons: 1. It frees up my Sundays for important "me" things; like shopping. 2. It means at least one night during the season is sandwich night...because when the Philadelphia Eagles play a night game the ritual in our house is sandwiches. So this past Sunday was sandwich night. Perfect timing since I had just received my copy of Kicked Up Sandwiches. After a quick browse through the book I decided to make the: Grilled Flank Steak with Balsamic Glazed Peppers. The flank steak is marinated and charred in a grill pan. The bell peppers and onions are slow cooked and finished with balsamic vinegar. Sandwiched between two slices of ciabatta spread with homemade mayonaise (recipe included in the book) and oozing with melted provolone cheese this was a great football night choice. Like the Eagles this sandwich is a winner. Unfortunately we are not allowed to share this recipe so if you want a taste you will need to purchase Emeril's new book. Or follow the instructions below to win a copy. Contests ends Oct. 15th. Of course you can also pre-order a copy. What a delicious looking sandwich!I love sandwiches made with pita bread, hummus and fresh vegetables . 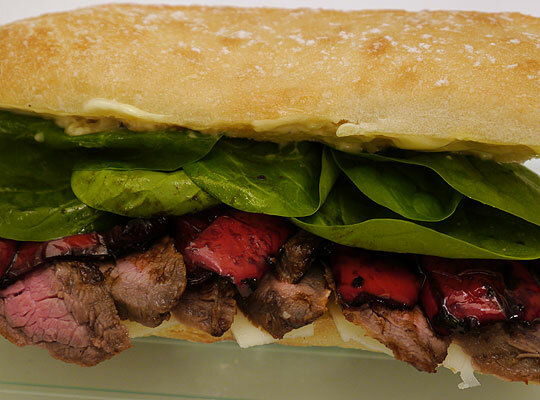 I adore flank steak ... and this sandwich looks amazing! Glad to be participating in #SeriousSandwich with you! Now that is my kind of sandwich! I like roast beef with horseradish spread and red onion and avocado and swiss cheese--grilled as a panino. I follow you on twitter: ljskop. Great job with the sandwich! If you ever need a Philly care package, just let me know :) Might help ease the pain of Vick lately.